Review posted June 2, 2016. Boyds Mills Press, 2015. 32 pages. Here’s another picture book about the power of imagination and writing your own stories. For every story, there is a beginning and an end, but what happens in between makes all the difference. 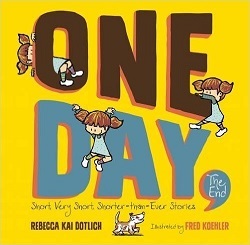 The rest of the book gives many short, very short, shorter-than-ever stories about one little girl. That is, it tells the beginnings and ends of stories. The pictures vividly show what happens in between. Truly, that makes all the difference! One day . . . I made something. I gave it to Mom. The End? The front flap introduces the girl character with the heading, “Meet the Storyteller.” She’s busy and imaginative. The pictures show her all over the place in a way that conveys boundless energy. I am very curious as I write this how much direction the author gave the illustrator. Did she simply come up with these simple frameworks and let him fill in the rest? Or did she supply a few of the ideas? All of the ideas? However they came up with it, the combination works beautifully! With each story, the little girl makes her way across the page, full of energy, doing things, having adventures. Most of them end with a smile, but there are some interesting variations (such as when the dog jumps into the tub with her). The pictures for that review all the previous adventures found in this picture book, leaving the reader with a reminder that all you need for a story is a beginning and an end . . . and let your imagination run wild with the in-between.